When six spiritually unhappy individuals pair up in rather unrelated situations, they all find themselves on route to the same destination: a $5000 prize at an Omaha, Nebraska karaoke contest. One pair are newly-acquainted father and daughter, who bond throughout the movie on various ventures into karaoke competitions in local bars. The second pair consists of a business man who is overwrought with anxiety because his family ignores him, and an escaped convict with a voice that would captivate saints. The third is, rather pointlessly, a cab driver with the breakup blues, who agrees to take an ambitious waitress across the country to this contest just as long as she continues to perform sexual favors. For any person even slightly interested in seeing “Duets,” which is a road movie without any sense of direction or stability, perhaps these descriptions alone will help shape your final decision. “Duets” is one of the most muddled, unconvincing pictures you will ever see this year; an off-the-wall exercise where ingredients such as pretentious dramatics, halfhearted comedy, shaky characters and relentless studio sentiment are hammered together without reason or consistency. Directed by Bruce Paltrow, father to the movie’s star, Gwyneth Paltrow, the picture functions with limited accessibility, combining stories so hastily that viewers are unable to grow comfortable with the setup. Each specific story adopts its own incentive, and because they are told at intervals throughout the 112-minute running time, the movie never manages to ground itself on the terms of a reasonable tone. Even though all three of them are sloppy, one story would be enough to satisfy the picture’s narrative needs. The marriage of the three is just overkill. 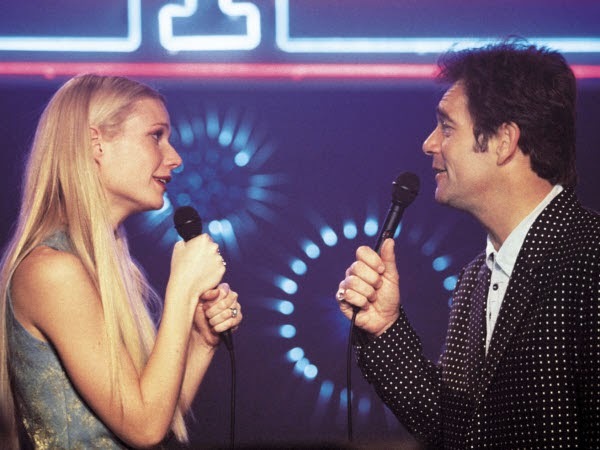 The movie opens with Ricky Dean (Huey Lewis), a karaoke hustler of sorts, challenging the night’s entertainment to a singing bet that involves large wads of cash. People feel up to his challenges because Dean’s appearance at these places is not that suspicious: he dresses in a loud tone, wears glasses, and pretends to care little about the competition, even questioning why anyone would want to do it. He beats the pants off of his competitors, needless to say, and carries the money off with him. His routine lifestyle changes, however, when a former girlfriend dies, he attends the funeral, and meets (for the first time) his daughter Liv (Gwyneth Paltrow), who is a Las Vegas showgirl and can’t wait to get to know her father. Paltrow is a cheery actress, and even Lewis has touches of merit on his part, but both of them trample through the story without much convincing momentum, using the script’s melodrama like it was a survivor’s guide. In another approach, we meet Todd Woods (Paul Giamatti), whose traveling salesman business and neglecting family have sucked the energy from his soul, encouraging him to go traveling across the country to search for himself. Giamatti has the only strong performance here because he never treads into the pool of dramatic manipulation; when he rants, he sounds sincere, has validity in his expression, and we even identify with his frustration. But then there’s an awkward change of priorities when Todd picks up a hitchhiker named Reggie Kane—who is an ex-con only experienced in singing and stealing—and the two strike up a friendship that leads them towards Omaha. The pairing is amusing, but the chemistry feels one-sided. Following these formations comes Billy (Scott Speedman), a cab driver who has grown flustered over his recent breakup. He picks up waitress Suzi Loomis one day, and she convinces him to take her to this big competition in Omaha in exchange for, well, practically anything he wants. Both of the characters here are obviously unhappy, but the script never dives into their personas, letting them drift at the surface while the other two stories get more screen exposure. Somehow, someway, this is all supposed to lead us into one big and fancy climax with a deep sense of meaning, but alas, like the story configurations, it doesn’t have any real ambush (other than the fact that there actually is a climax amongst all of this mess). The bottom line here is that “Duets” is a complete miscalculation, uneven and bland, without a clue as to who it wants to please.